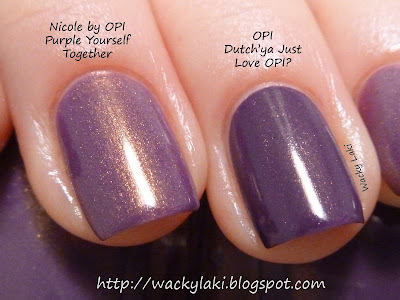 Wacky Laki: Comparison: Nicole by OPI Purple Yourself Together vs. OPI Dutch'ya Just Love OPI? As you can see that while they do look very similar in the bottles they are different on the nail. Purple Yourself together is a lighter purple with a strong gold shimmer that does not hide. It also has a thinner formula which results in needing three coats to be fully opaque. Dutch'ya Just Love OPI? is a darker purple and has a more pigmented formula which required only two coats to be fully opaque. Possibly because it is so pigmented, the shimmer does not show up as much as in Purple Yourself Together. I like Purple Yourself Together best. Thanks for comparing! I definitely prefer Purple Yourself Together. 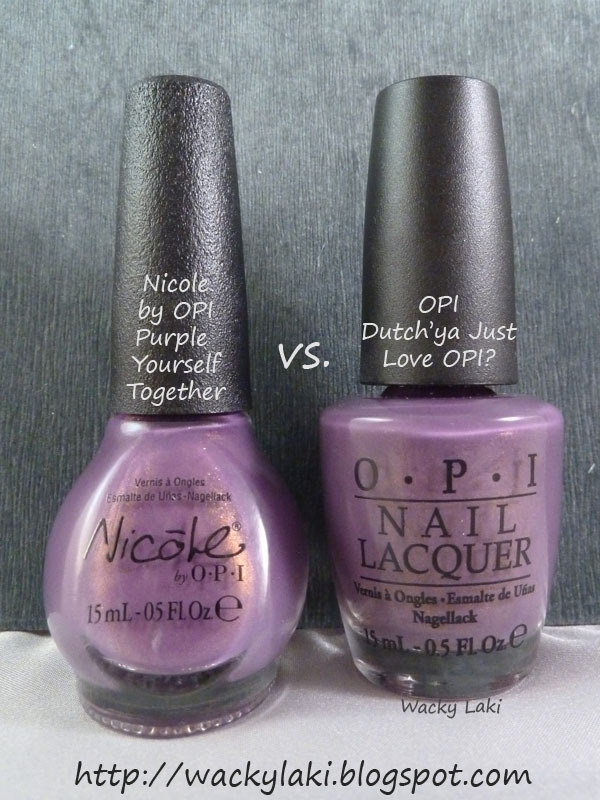 I picked up most of the Holland shades, but Dutch'ya Just Love OPI wasn't one of them- I think it looks kind of similar to other purples I own. 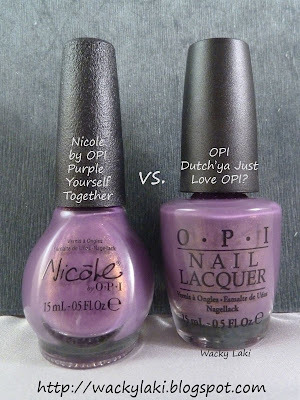 I really like Purple Yourself better but we don't get Nicole for OPI here! I like that it's got more gold shimmer in it! I think i like Dutch'ya Just Love better. but the other is pretty too! I'm so glad that this was useful. I will try to do more comparisons like this in the future! I think there is a really cheap dupe out there from NYX GIRLS called Golden Lavender. Its builds to look like Nicole OPI color. Very pretty and easy formula to use also. love that color from the Holland collection also. Does anyone have both NYX GIRLS and the Nicole purples to compare?